Love these blue-ish green puffs! The weather was so lovely out this morning that I decided to take some pictures outside! 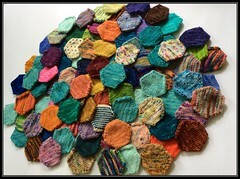 Goal #1 Met: 25 Hexipuffs Complete! 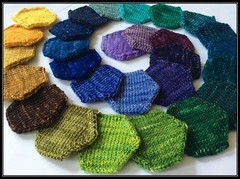 25 hexipuffs complete in 20 days! That means that it is time for my first goal completion gift (prize?) of acquiring more mini-skeins for this project! 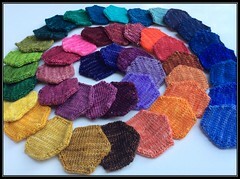 I looked back at my previous thread about mini packs I was interested in purchasing and decided on the “repeatable colors, an assorted pack of hand dyed sock yarn minis” from Three Fates Yarn on Etsy. But lo and behold, it has been sold. Argh! The yarn gods were not on my side, bummer I did reach out to the seller to see if there was anyway to replicate the 24 mini-skein set through a custom order. I will likely wait to hear back from her before proceeding to purchase another set elsewhere. Lord know I have enough mini-skeins on hand to keep me busy. So onto my next goal of 50 hexipuffs! 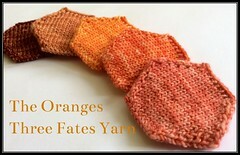 Update – I heard from the Etsy owner of Three Fates Yarn and she is happy to work with me on a custom order! Yippee! It may take a bit longer to receive these minis, but I definitely think it will be worth it! We are figuring out colors now. So I have knit 24 hexipuffs and am starting to look even more closely at my puff construction. The bottom still seems shorter than the top part so I decided to add yet another row of plain knitting to see if that makes up the height. The mod is adding an extra row of plain knitting after increases 12, 16, and 20. So far I have knit 2 puffs this way and I believe that they look even better. I am certainly not going to be reknitting the first 22 as the difference isn’t that drastic. It seems that not stuffing the puffs has a lot to do with this difference in the top and bottom being so noticeable. Color – Unknown; For the life of me, I cannot identify this colorway. I have looked Rhichard’s website countless times, searched online vendor sites, but simply cannot find the name of this colorway. I could contact the Etsy seller I purchased it from, but this pack was from months ago. I guess it could possibily be a discontinued colorway.